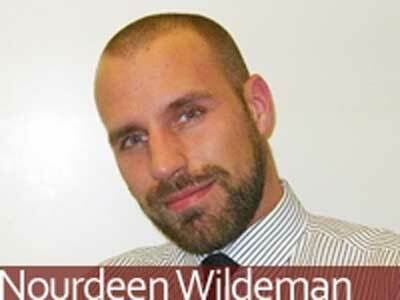 Nourdeen Wildeman, 26, is a Dutch citizen who "officially" converted to Islam on December 9, 2007. Although the new converts, he has been active in the propagation of Islam. Currently, he is preparing the launch of an ongoing propaganda program with the theme, "Discover the mosque that serves the best for you." The program aims to record the profile of the mosques in the Netherlands. Through this program, every Muslim is expected to know everything about the mosque, all information relating to every mosque. This program presents a complete profile of every mosque, such as ethnic background, address, zip code, telephone number, e-mail, pictures of mosques, the language used in Friday sermons, bookstore, load capacity mosque for men and women, availability wudlu bathroom and place for both male or female, and not behind some common conditions, such as old buildings, no parking, special lessons, completeness, and also the prayer schedule in accordance with the specific location. Nourdeen claimed not to know exactly when he really became a Muslim. Acquaintance with Islam started four or five years before he officially mengucapakan two sentences creed. It all starts with curiosity about Islam, who was warm-warm discussed in the European media, post-September 11. "The first book that I read about Islam is very academic and very difficult to understand. Therefore I decided to find another book so I can more easily understand Islam, and I continued to read and more, "recalls Nourdeen. "After reading many books, I discovered that Islam is not like me for this assumption. Indeed many of the teachings of Islam according to what I believe is natural, "he added. According Nourdeen, Most of the imaging media against Islam completely wrong. Assumption of Western media that Islam is the religion of the oppressors of women's rights is a big mistake. Islam is also not a religion of violence and terrorism. For him, Islam is not just a religion of peace but also respect the religious sense. "I found Islam as a religion that is rational. A religion that supports science. He encourages people to understand and menafakkuri everything around. A religion that asked people to think critically, "he explained. "Before you go into Islam, I always thought that being an atheist may be more easy and delicious, I could be free to do whatever I want, but little heart I have always criticized the lifestyle like that, and I finally reach the consciousness of God. This is the truth that I felt in the Koran and the hadith, "he admits. Nourdeen born and raised in a family with multikepercayaan, his father was an atheist, while his mother adherents of the Protestant Christian religion. His decision to become converts did not receive significant opposition from his family. Nourdeen desire to become a Muslim he did not immediately tell her parents. Nourdeen beruhasa only provoke their reaction to ask them if they switch to other religions such as Islam, they claim that it is the choice of your life, for not disturbing anyone, he is free to decide. Nevertheless Nourdeen mother had advised him that it's easier to be Christian. Nourdeen replied, "I am not looking for the easiest religion, but palaing true." In contrast to his mother, his father actually gave full support to his decision. "I am very willing to accompany my father bahagiaakarena when I say two sentences creed, and was recorded by video cameras. He supports me because I was part of him, and Islam will become a part of me, then he will accept me with my Islamic, "said Nourdeen. The freedom given her family is recognized as a gift Nourdeen great. Because according to him, not a few friends converts who are facing serious problems due to opposition from the family. "In fact, that many of the converts who are facing family problems when they declare themselves as Muslims. The average is facing problems like this are women, "he said. "I have great respect for women in this country who became converts, because the conditions they face more difficult, not to mention the problem of clothes they wear. Some even expelled from their homes and their families would not accept them anymore. Therefore, I am very lucky, thank God, with my family. Nourdeen get any positive response from his superiors. After officially became a Muslim, Nourdeen then send an e-mail to his superiors to inform atasanya such that he had become a Muslim. "But, thank God, I do not get scolded. Instead I got a bonus at the end of the year based on an evaluation of my work. My boss said that in addition to my own a good performance, I was also able to make a difficult choice when I chose to become a Muslim. He said that I had the courage to take difficult choices in addition I was able to work well, "he explained. After officially converted to Islam, Nourdeen still vibrant in studying Islam. He also frequently discuss with Muslims more senior, but his penchant devouring books justu make Islam more than they know about Islam. "I read the book by Tariq Ramadan called In the Footsteps of the Prophet (Traces of the Prophet). This book helped me a lot as European Muslims because it is written in a way suitable for Westerners. Arabic method of writing a different story with Western methods, but Tariq Ramadan able to convey his message using a Western approach, "said Nourdeen. "Today, I also studied the Qur'an at Dar al-'Ilm in the Netherlands. This place provides a thorough study of the Koran from A to Z according to Tafsir Ibn Kathir, "he added. Congratulations to you Nourdeen Wildeman... God has guided us and you to the straight path, Amen.